The emergence of functional coatings such as anti-reflective and anti-fingerprint coatings has led to the increased efficiency of the product, thereby providing larger degree of sustainability and additional features. The usage of consumer goods such as mobile phones, tablets, and wearables have become indispensable in the present social scenario. The fingerprint stains on the surface of touch screen along with the reflectivity issue require the application of efficient coatings that would repel the deposition of dirt and stains and allow minimal reflectance of light. The application of anti-reflective and anti-fingerprint coatings not only makes the product aesthetically pleasing but also help in reducing strain on eyes. Owing to continuous ongoing research and development in this field, the effectiveness of these coatings is gradually being improved, which is anticipated to increase their utility and adoption in multiple end-user industries in the coming future. The report is a compilation of different segments of the global anti-reflective and anti-fingerprint coatings market, including market breakdown by material type, technology type, layer type, application, and geographical areas. Herein, the revenue generated from the material types (silicon-based, titanium-based, and others), technology types (vacuum deposition, sol gel and others), layer type (single-layer and multi-layer), application (automotive, building and construction, consumer goods, solar, stainless steel, and others) and geographies (North America, Europe, Asia-Pacific, Middle East and Africa, and South America) are tracked to calculate the overall market size in terms of value ($million) and volume (million square meters). 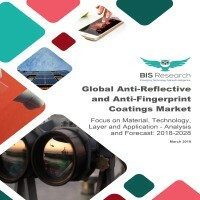 While highlighting the key driving and restraining forces for this market, the report also provides a detailed summary of the global anti-reflective and anti-fingerprint coatings market. It also includes the key participants involved in the industry at the relevant sections. The report further includes a thorough analysis of the impact of the Porter’s Five Forces to understand the overall attractiveness of the industry. The most commonly used strategy for a better hold on the market has been product launches from the period January 2015 to January 2019. Moreover, the company profiles section highlights significant information about the key companies involved along with their financial positions, key strategies, and developmental activities of recent years. Further, the report includes an exhaustive analysis of the geographical split into North America, Europe, Asia-Pacific (APAC), Middle East and Africa, and South America. Each geography details the individual push and pull forces in addition to the key players from that region. This report is a meticulous compilation of research on more than 100 players in the global anti-reflective and anti-fingerprint coatings market and draws upon the insights from in-depth interviews with the key opinion leaders of more than 50 leading companies, market participants, and vendors. The report also profiles approximately 15 supplier profiles with their financial analysis, SWOT, and product portfolio. 9.10 NAGASE & CO., LTD.
9.13 NIPPON PAINT SURF CHEMICALS Co., Ltd.
9.16 Sumitomo Chemical Co., Ltd. The coatings industry has evolved by leaps and bounds due to the rising needs of the manufacturing processes and innovation in the engineering applications. Coatings are essentially applied for protecting, preserving, and beautification of the products. The coatings industry has undergone a gradual shift from its traditional usage of providing a quality finish and feel, to being used as a process of surface treatment, thereby adding value to the product. Technological advancements in the manufacturing sector along with extensive ongoing research to improve the existing manufacturing alternatives has laid the foundation for the usage of innovative functional coatings. Coatings aid in obtaining durability and additional customized features such as corrosion resistance, wear and tear resistance, and fouling resistance, among others. The demand for coatings with anti-reflective and anti-fingerprint properties has been rapidly increasing on a year-on-year basis. The anti-reflective coatings have a broad utility in major end-user industries owing to their cost effectiveness and glare reduction properties. This coating provides resistance from reflectance of light which is a key requirement for solar industry as it helps in obtaining absorbing larger amount of energy. The adoption of anti-reflective coating has provided the end-user markets a breakthrough technology which aids in enhancing the quality of the product. Anti-fingerprint coating, on the other hand, is widely used to provide anti-smudging properties. The anti-fingerprint coating enables in achieving lower maintenance cost and facilitating lesser adhesion of dirt and moisture. These innovative properties have propelled the growth of anti-fingerprint coatings in the market. The anti-reflective and anti-fingerprint coatings are being utilized by the end-user companies as a strategy to differentiate their product in a much competitive market. Furthermore, the adoption of these coatings also helps the companies in obtaining a cost advantage and impacts the entire value chain of the production procedure. The wide range of useful properties of these two coatings have led to the development of a number of applications, which are paving their way toward practical and commercial applicability. Currently, the major application areas of anti-reflective coatings include automotive industry, consumer goods industry, solar industry, building and construction industry, and others. The specific applicability of anti-fingerprint coatings is found in end-user industries such as automotive, building and construction, consumer goods, and stainless steel, among others. Some of the key players operating in the anti-reflective and anti-fingerprint coatings market include AGC Inc., Carl Zeiss AG, Daikin Industries, Ltd., Essilor International S.A., NAGASE & CO., LTD., PPG Industries Inc., Royal DSM, Sumitomo Chemical Co., Ltd., Cytonix, LLC, Izovac Ltd., Janos Technology, LLC, Kriya Materials, NANOKOTE PTY LTD, Natoco Co., Ltd., and NIPPON PAINT SURF CHEMICALS Co.Ltd. The key players operating in this market have increased the research and development activities over the recent years to generate efficient coating to compete with the competitors’ product portfolio.